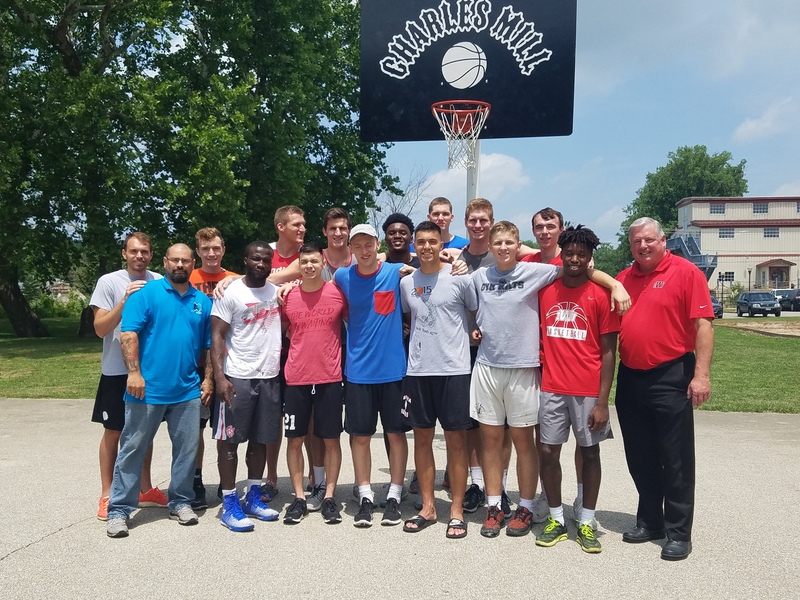 Charles Mill Park has received fresh paint and bas­ket­ball court resur­fac­ing thanks to mem­bers of the Indi­ana Wes­leyan Uni­ver­si­ty Men’s Bas­ket­ball Team. 13 play­ers and the assis­tant coach gave the shel­ter and bath­rooms fresh exte­ri­or paint, as well as the play­ground swing and pic­nic tables. They also resur­faced the bas­ket­ball court and paint­ed the poles for the new­ly designed and paint­ed back­boards recent­ly com­plet­ed by the City­wide Main­te­nance Department. The team car­ried out this project through an ongo­ing part­ner­ship between the IWU Ath­let­ic Depart­ment, the Unit­ed Way of Grant Coun­ty, and the City of Marion. May­or Jess Alum­baugh said he was impressed by the team’s quick action, and expressed thanks for their ded­i­ca­tion toward the project. “Just mak­ing the city more attrac­tive is huge for the com­mu­ni­ty. The impact IWU has here is unbe­liev­able. Hope­ful­ly, this park project will inspire oth­er groups to take on a project,” stat­ed Alumbaugh.